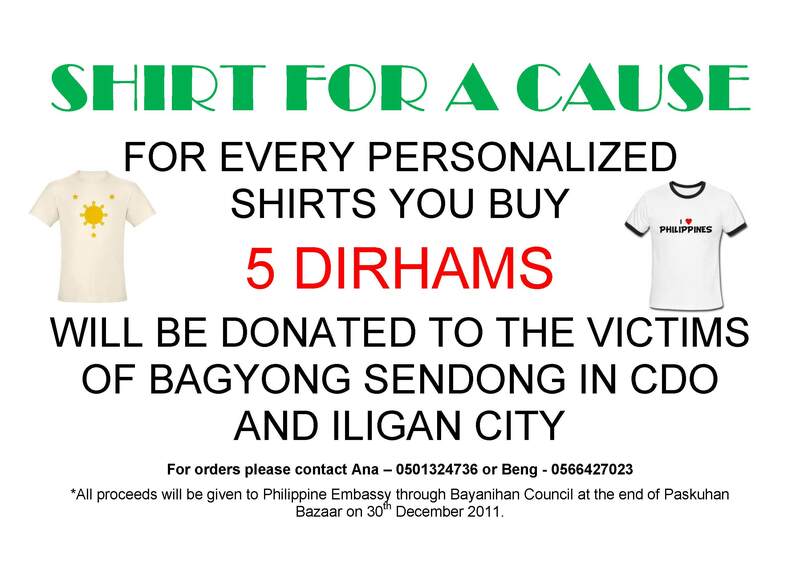 As a way of helping our Kababayan’s in CDO and Iligan City affected by Bagyong Sendong, I organized Shirt for a Cause. T-shirts provided by Printsonalized.com. As of today I already sold 30 pcs. of Personalized Shirts and still counting. I hope more T-shirts will be sold before the month end. If you are in Abu Dhabi you can help also by buying Printsonalized Shirt. Just call the contact details in the poster or you can drop e-mail to me analynalbesa@gmail.com. Nakatulong ka na may T-Shirt ka pa? Update: I sold out 50 pcs of Shirts for 10 days (December 20-30, 2011). Donations was sent to Philippine Embassy through Bayanihan Council. Thank you for those people who supported my Shirt for a Cause! very good idea here ana. praying for the people in cdo too. happy new year too! Thanks PM for dropping by! Happy New Year! Thanks for helping us here in CDO and Iligan!